Between 1986 and 2002, the town of Falmouth acquired 13 parcels of undeveloped land in the Three Ponds area of Hatchville to protect the Mares Pond municipal well. 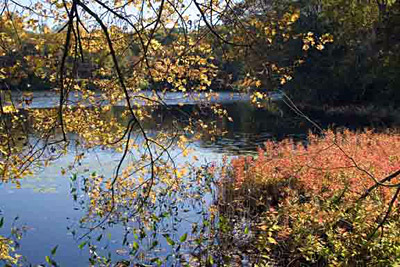 Combined, they form the 152-acre Mares Pond Reservation, with frontage on Deer Pond, Mares Pond and Spectacle Pond. The well site is right in the middle of the reservation. By protecting the drinking water source, the town has also protected a hiking area and many acres of habitat for birds and other wildlife. 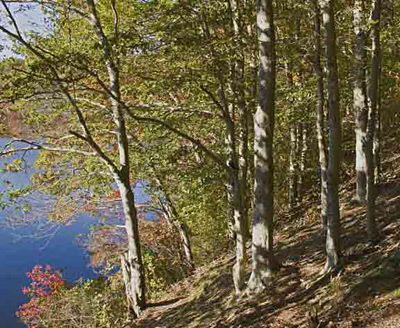 Access to the network of wooded trails at Mares Pond is on Pinecrest Beach Drive, off Deepwood Drive from Sandwich Road. There is a grassy area for a few cars on the south side of Pinecrest Beach, just northwest of the dirt road (usually gated) that leads to the water tower. The reservation occupies the gently rolling outwash plain of central Falmouth, with none of the large rocks or rock walls so common on the moraine in North and West Falmouth. The area is well wooded with a second growth of oak and pine; early residents used the land for grazing and wood-cutting.